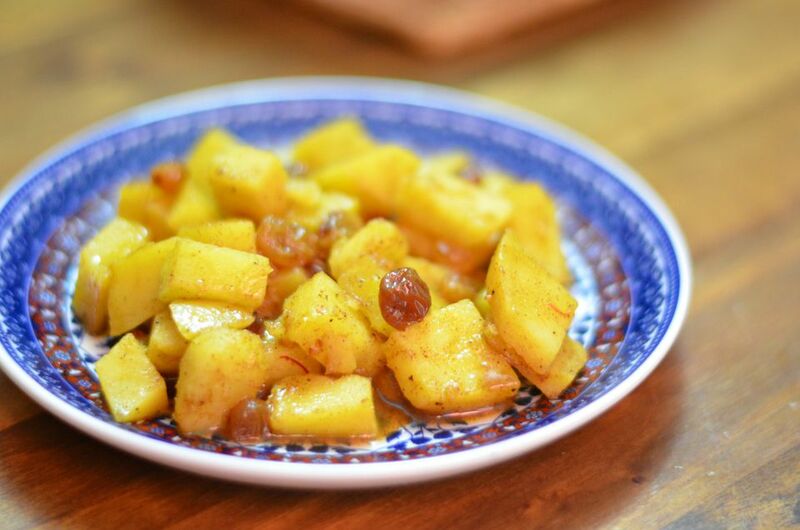 Although lots of Moroccan salads are intended to be eaten as dips with crusty bread such as khobz, this fragrant sweet potato (batata hlouwa) salad breaks that rule and begs for a fork. Sweet potatoes or yams are diced, simmered until tender and then gently mixed with a rich buttery syrup flavored with cinnamon, saffron, and honey. Easy, sweet and delicious! Raisins are an optional but very complementary addition. Serve the salad as an accompaniment to spicy meals, sweet and savory tagines, roast chicken or turkey and grilled meats. Or, consider making it a vegetarian entree by serving it with Moroccan caramelized onions and raisins (tfaya) over couscous, rice or other grains. Also, try sweet potatoes in Moroccan Couscous with Seven Vegetables. If using the raisins, pick them over and discard any stems. Place them in a small bowl, cover with boiling water and set them aside to soak while starting the salad preparations. Peel the sweet potatoes and cut into 1/2" slices. Cut each slice into 1/2" sticks; then bundle up the sticks and cut them into 1/2" cubes. The more uniformly-sized the sweet potato cubes, the more evenly they will cook. Wash the sweet potato cubes in a bowl of cold water; swirl them around with your fingers to help remove excess starch. Drain the cubed potatoes in a colander, rinse with running water and transfer to a 2-quart pot. Cover the potatoes with cold salted water, place over high heat and bring to a boil. Cook for about 5 minutes, or just until the potatoes are tender. Try to avoid overcooking or the cubes will lose their clean edges and became mushy. Pour out the cooked sweet potatoes into a colander and leave to drain while you make the syrup. Drain the raisins and place them in the same pot in which the potatoes were cooked. Add the honey, butter, water, and spices. Bring to a simmer over medium heat and cook for 1 to 3 minutes, or until a syrup forms. Taste and adjust seasoning. Return the sweet potatoes to the pot and very gently stir to coat them with the syrup. Serve the sweet potatoes warm or at room temperature.